In December 2016, HUD published the Housing Counseling New Certification Requirements Final Rule. 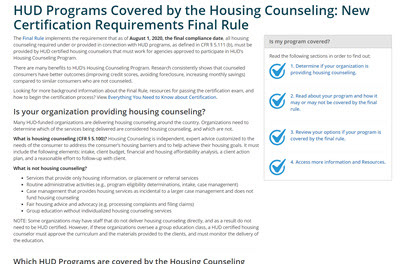 The Final Rule implements statutory requirements that housing counseling required under or provided in connection with all HUD programs must be provided by HUD Certified Housing Counselors by August 1, 2020. 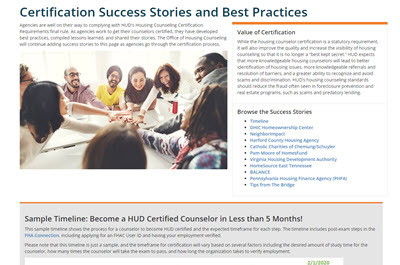 The pages below provide more information about HUD's housing counseling certification final rule, exam, covered programs, success stories, and best practices. 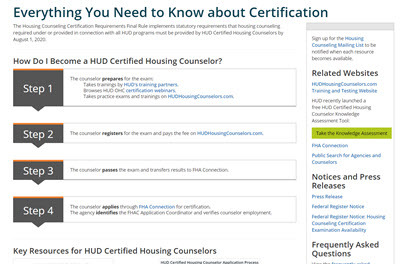 This page covers everything you need to know about the certification final rule and the examination process, including key resources for HUD Certified Housing Counselors. 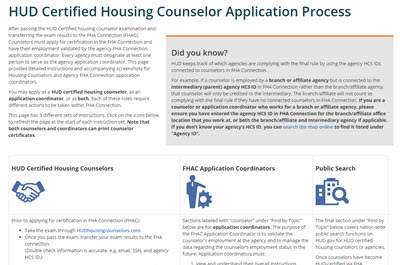 This page provides the application instructions through FHA Connection for HUD housing counseling Certification. The final rule standardizes housing counseling requirements over all HUD programs. Read this page to figure out if your HUD program is covered by the final rule and review your options for complying. To meet HUD's new requirements by the final compliance date, HUD is tracking the progress of HUD certification in every agency. This page provides a tracking graphic and information about agencies that have already met their goal. 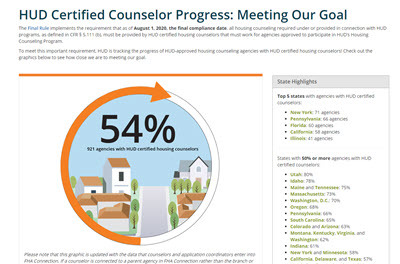 As agencies work to get their counselors certified, they have developed best practices, compiled lessons learned, and shared their stories with HUD. 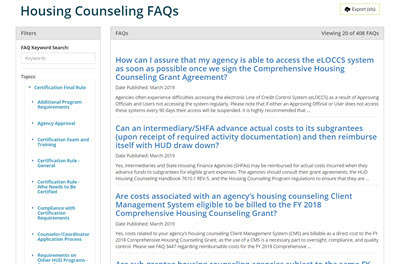 The Office of Housing Counseling has published almost 200 Frequently Asked Questions (FAQs) on a wide range of topics related to HUD Certification.